Forgiveness is perhaps one of the most controversial of Christian duties. Easy to talk about but difficult to practice. Christians in Malaysia are angry over the way they are being treated. In the past few years, bibles have been seized, our religious vocabulary restricted, church buildings firebombed and the entire community villified and made the scapegoat for part of the nation’s ills. With some interpretive wizardry, perhaps we can make these verses say the opposite. But the logic of interpreting these words to mean an aggressive or retaliatory response breaks down when we look at Jesus’ own conduct when he himself was persecuted. Like every Christian, I was infuriated by JAIS’ raid on the Bible Society, the way my colleague and I were manhandled and hauled off to the police station and our sacred books unceremoniously bundled into vans used to transport khalwat offenders and transvestites. Two days after the event, I obtained my society’s mandate to take whatever legal action necessary. In the days that followed, as I reflected on Jesus Christ and on his teachings and example, it became clear that the greatest hurdle was not the systematic infringement of the Christian community’s legal and constitutional right to freedom of religion. Our greatest enemy was ourselves and the demon threatening to possess us was the natural human urge to satisfy that bloodlust for vengeance. The defeat facing us not legal or political but spiritual. When we show a distorted and perverted picture of Jesus Christ and His Church to the nation, we would have lost everything. The Spirit of God provides to God’s people in sufficient measure love, joy, peace, patience, kindness, goodness, faithfulness, gentleness and self-control (Galatians 5:22-23). The events of the past few days (viz. JAIS’ refusal to follow directives of the Attorney-General and the Menteri Besar to return the bibles) have caused many to question whether forgiving JAIS was premature or undeserved. Christian forgiveness is unconditional. On the cross, Jesus Christ forgave his persecutors even though they were unrepentant and offered no apology. Jesus also knew the future. The night before, he warned his disciples that those who seek his death will also persecute his disciples in the future. Yet, he forgave these men knowing that their future actions will be undeserving of the kindness he showed them. Christians forgive because it is the right and Christian thing to do. We also forgive because God through Jesus Christ forgave us of our sins and bestowed on us the privilege of being in God’s family. As God has forgiven us, so we forgive those who sinned against us. We pray for them hoping that their wrongs will not blind them to the truth and preventing them from receiving God’s forgiveness and blessing of eternal life. My last post suggested that JAIS be relieved of their appointment as enforcers of the 1988 Selangor anti-propagation law. This does not conflict with forgiveness. One can be forgiven of wrongdoing. But if possible the offender should not be placed in a position to continue doing wrong. For example, even a child molester can be forgiven but he should not be entrusted with the care of children. Our trust in God was vindicated a few days ago when the AG announced his finding that BSM had broken no law, that the case be closed and the bibles be returned. JAIS is unable to accept the AG’s decision. Christians must be patient and continue to trust God that the solution that God wants to give to us will come about eventually. The rejection of the Attorney-General’s decision by MAIS and JAIS and their refusal to return Bibles seized from BSM has precipitated a crisis in Selangor state (see link). Firstly, there is now a crisis of confidence in the State government. A state department has declared its autonomy of the Menteri Besar and the State EXCO. They answer to no one. They have taken upon themselves to be infallible interpreters of the law to the extent that they reject the decision of the AG. In doing so, they have undermined the AG’s constitutional role as the final arbiter of all criminal investigations and prosecutions. Secondly, MAIS and JAIS by their recent announcements have stated that they regard the Malay and Iban Bible to be in breach of Selangor law in spite of what the AG has said. The practical implication of this is that JAIS with the approval of MAIS will carry out further raids on BSM as they regard BSM as lawbreakers in spite of what the AG has said. Further, they will also raid churches that have and use the Malay or Iban bibles, arrest Christian pastors and priests and seize more bibles in spite of what the AG has said. It matters not that the AG will refuse to prosecute. MAIS and JAIS will continue to act on their own and in defiance of the law as interpreted by the AG until their exhibit rooms are filled with seized bibles. Christians and churches will live in fear of JAIS. The MAIS and JAIS stand is unprecedented and a dangerous anomaly in modern government. There is no such thing as a government department that is not accountable and not subject to law as interpreted by those constitutionally appointed to interpret it. Also, MAIS and JAIS’s recalcitrance have shown that they have become unqualified and unfit to enforce the Selangor Non-Islamic Religions (Control of Propagation Among Muslims) Enactment 1988. What can the State EXCO do? Clearly, they must protect the people of Selangor from an uncontrollable department. They can easily do this by revoking the Gazette Notification published in 1999 that appointed MAIS and JAIS officials as enforcement officers under the 1988 Selangor Enactment. This incident have demonstrated the folly of appointing officers of one religion to police adherents of other religions. It is very clear that the job of enforcement should be given to secular authorities like the police to prevent religious bias from perverting the course of justice. Enforcement officers under the 1988 Selangor Enactment are appointed by the Ruler in council. This means that the Sultan of the State appoints the enforcement officers on the advice of the State EXCO. Thus, the revocation of such appointments are also on the same basis. It’s been one month since my last post. I stepped down as President of the Bible Society of Malaysia on May 10 after completing a maximum 5-year term. On the very next day, I flew to Munich to chair the annual meeting of the Global Council of Advocates International, the worldwide organisation of Christian lawyers. I managed to catch holidays in Salzburg and Prague and here I will tell a travel story. A most moving experience happened in Prague, Czech Republic. Prague has the appearance of a fairy tale city. There is so much of glitz to see but what caught my imagination was a tour to Terezin Concentration Camp and a walk through the Jewish Quarter of Prague. During 11 idyllic days in scenic Europe, the discrimination against religious minorities in Malaysia was never far from my mind. I wanted to see a facet of Prague that dealt with how discrimination in their society festered until it led to tragedy. The Jews came to Prague, capital of Bohemia, in the 10th century. They were resented by the local population. The reasons were many. They were ethnically and culturally different. Often, that is enough to raise fears. Perhaps, the key reason was economic. In spite of restrictions placed on Jews, they prospered. Retrictions on trading and commerce only served to spur the Jews to succeed to the extent that they became money lenders to Europe. Nobody loves a money lender. Shakespeare in his “Merchant of Venice” portrayed the Jew as an unscrupulous money lender. Prague’s rulers confined the Jews to a ghetto. They could not live or trade outside a walled city. They had to be indoors by night. This restriction on their movement meant that they could not take their dead for burial outside of the ghetto. The picture above is taken inside the Jewish Cemetery. 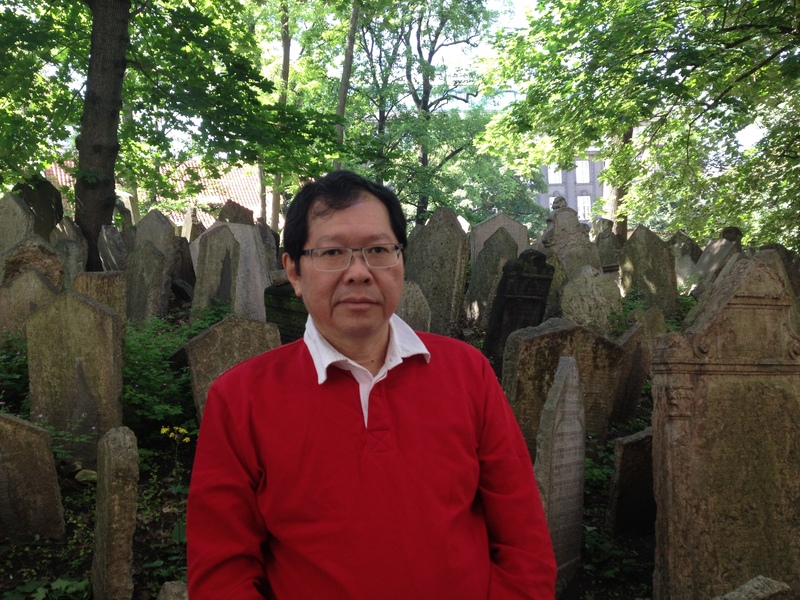 Prague’s Jews had to bury all their dead in the cemetery even though it was fully used. Over a period of 300 years, 20,000 people were buried in a small cemetery meant for only a few thousand. Up to twelve persons were buried in one spot, one on top of another. Gravestones jammed up around each other marked a final resting spot shared by multiple corpses. In 1389, the church spread a rumour that the Jews had desecrated the host (ie the wafer and the wine used in the Eucharist). Some children had thrown stones at the host as it was carried past the Jewish quarter in a Good Friday procession. The Jews were blamed by the Christians for offending the religious sensitivities of the Christians. It did not matter that it was not true. People believed it. Or rather, they wanted to believe that it was true. It reminded me of the news back home just before we left. At a conference in a university, Christians were blamed for various ills in the Muslim community. Does it matter that it was not true? Anyway, on Easter the Christians of Prague attacked the Jews in their ghetto. 3,000 Jews were massacred. As a result many Jews left Prague. Later, Bohemia’s rulers would regularly issue decrees ordering Jews to leave Prague. Go back where you came from! This is a cry that is always heard wherever discrimination rears its ugly head. It was only during the rule of some of Prague’s liberal rulers that the Jewish population in Prague recovered. Yet, for Jews who stayed, they had to live with a host of discriminatory laws regulating their private and social lives, trade, education, etc. The ultimate discrimination took place during the Second World War. Hitler decided that the Jews was a curse to the purity of Europe’s Aryan races and therefore shoud be exterminated. Prague played an important role in Hitler’s plans. All the treasures and artifacts plundered from the Jews all over Europe by the Nazi Armies were ordered to be sent to Prague. Hitler had planned to use Prague’s Jewish Quarter as a museum of the Jewish people after he had exterminted them. That is why the Jewish Museum in Prague which is spread out over half a dozen synagogues and ceremonial halls has the best collection of Jewish treasures and museum pieces. The Nazis sent Prague’s 70,000 Jews to live in another ghetto, the walled city of Terezin about 60 kilometres north of Prague. Terezin was built one hundred years earlier to protect Prague from an invasion from the north by Prussia. The attack never came and a smaller fortress a few kilometres outside Terezin was used to hold political prisoners of the Austrian Empire. The Nazis used the bigger fortress, the walled city of Terezin, to house the Jews of Prague and the smaller fortress as a prison and transit point for moving up to 300,000 Jews to the extermination camps to the East like Auschwitz, Treblinka, etc. 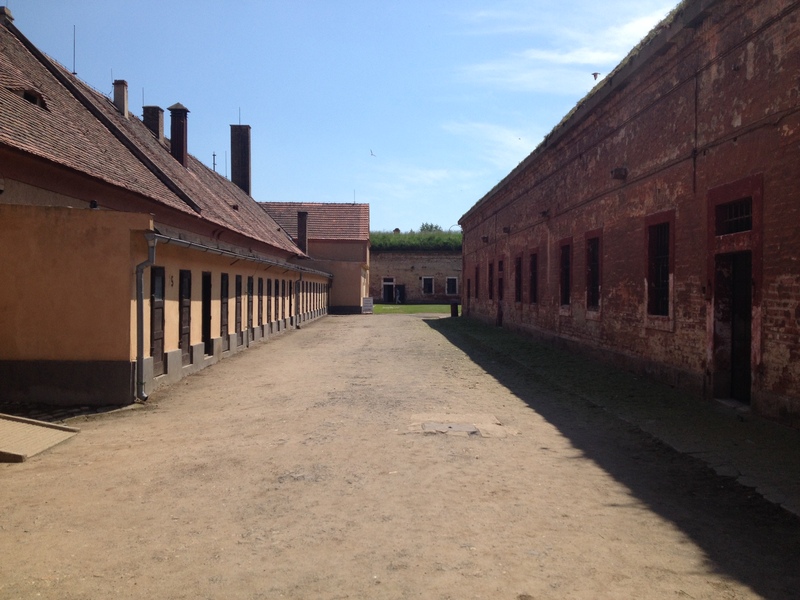 Throughout the war, Terezin housed up to 144,000 Jews transported from all over Europe. Over 33,000 died in Terezin while another 88,000 were eventually transported to the death camps. Among the prisoners of Terezin were 10,000 of Prague’s Jewish children. After the war, only 250 survived. The names of all the children who died are engraved on the walls of the school house in Terezin. Writings and drawings by the children adorn the museums there as a testimony to a people who continued to organise education, promote art and culture even though they knew that death was appoaching. When Terezin was liberated by the Soviet armies, over 60,000 of Prague’s Jews had perished. The Nazis cremated as many of the corpses as they could and dumped the ashes in the river. After the war, the incinerators continued to be used for months to cremate the rest of the dead. Go on a tour of Terezin when you visit Prague. Let it bring you back to the reality of life in this world. Walk through the Jewish Quarter of Prague and see the ugliness of human nature behind the gold and gild of Prague’s towers and monuments. Discrimination begins with a perception, a perceived threat from a minority to the majority’s way of life, identity or self-respect. This perceived threat becomes the basis for discriminatory laws and policies in the name of protection of the majority. The minority is then isolated, disempowered and regulated. The power of the media is called up every now and then to frighten people about the threat posed by the minority. Eventually, when people are told that even laws and policies cannot subdue the minority, the only solution (for the Nazis, the final solution) left is extermination.